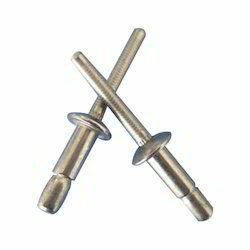 Prominent & Leading Manufacturer from Ahmedabad, we offer large head multi grip blind rivets, blind rivet grip counter sunk head rivet and multi grip dome head blind rivets. The scope of our Large Head Multi Grip Blind Rivets have wide hold go so one bolt can take the spot of different bolts consequently diminishing stock and mystery. Further our scope of multi-hold visually impaired bolts can rearrange stock control and suit wide varieties in material thickness. These are of high quality and are suitable for the mixed bag of joint applications. They suit over measured gaps and are vibration and dampness safe. In our item, a substantial blind spot bearing region spreads the brace burden, making it perfect for utilization in slender sheet metal. We are among the transcendent names of the business to take part in showing Blind Rivet Grip Counter SunkHead that is fabricated as per the set business rules. Offered choice is hugely acknowledged and acknowledged for its general mechanical execution and fast establishment. The proposed set of visually impaired bolts comprises of two of two segments, a bolt body and mandrel. We offer these at reasonable expenses. We yield incomparable scope of Multi Grip Dome HeadBlind Rivets can decrease stock, rearranges stock control and oblige wide varieties in material thickness. The Multi Grip Blind Rivets are intended to give superior and pander to the necessity of different commercial enterprises. We offer the Multi Grip Blind Rivets at aggressive costs.